"It's all about identifying the gap," she reveals. ​An engineer by profession, Mohini Boparai Guleria decided to give it all up to follow her childhood dream—working in the world of fashion. 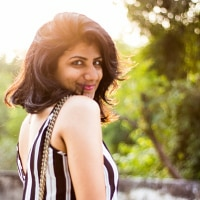 So, she joined forces with her then-fiancé-now-husband Sunjay Guleria to start exclusively.com, which she heads as the Creative and Fashion Director. "While e-commerce was growing abroad, there was virtually no online access to Indian fashion. People would have to travel all the way to India to shop for, say, a wedding," Mohini explains. Her expertise lies in identifying this gap and acting on it immediately. Think of Exclusively as a swanky multi-designer boutique that offers the best of Indian fashion, but virtually—and a perfectly curated one at that, courtesy Mohini's discerning eyes.